Chana masala generates instant interest for the both of us. And we don't like any tempering with the original recipe of this kale chane ki ghughni. Original recipe here means the recipe which has been a family favorite for years and has traveled down generations to reach us. 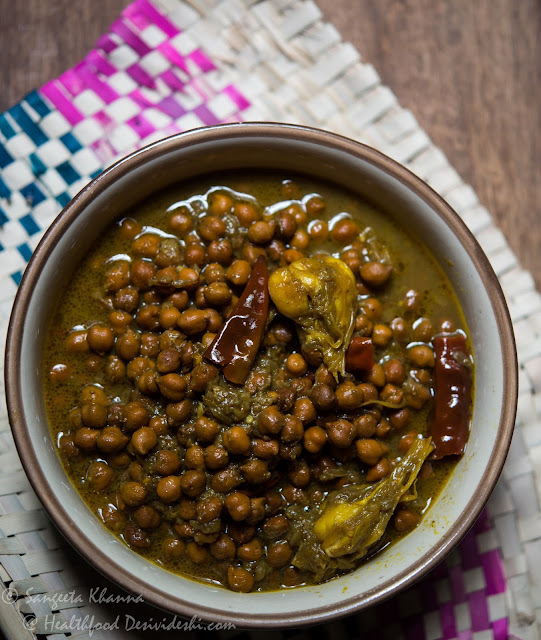 The sookha chana masala or sookhi ghugni made on the 8th day of navaratri is the more common in my kitchen when in a hurry. This one is called lipte masale ki ghugni, the spicy gravy almost enveloping each of the chickpea in there. This is an eastern UP recipe as I have seen it being made almost the same way in many families belonging to that part of the country, minor variations being in the thickness of the gravy or hotness of the spice blend. 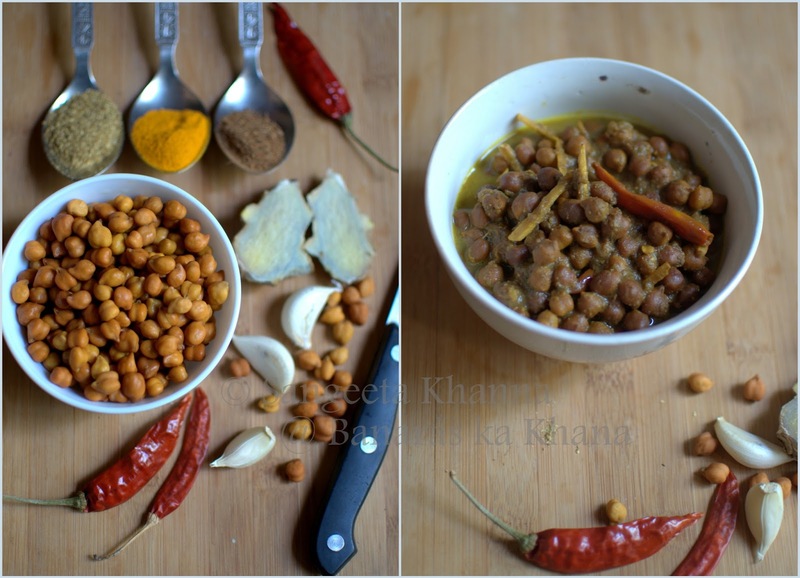 Both the chana ghugnis are very different in taste and you can feel the difference as soon as you open the lid of the pressure cooker and the aroma hits you. The presence of onion and garlic and the ginger julienne takes this recipe to another level. I like both the recipes and it actually depends on what I am serving it with when i decide which one to cook. Sookhi ghugni goes well with pooris while this one can accommodate chapatis, parathas or plain boiled rice. Make this lipte masale ki ghugni if you have 10 minutes for hand processing and about 15-20 minutes of cooking time. This is cooked in pressure cooker for convenience and time saving. Pan cooking takes long time and only thick base round bottom pans with tight lid are suitable for this kind of recipes. Add about 3 times water than the chickpeas if cooking in a pan and cook covered for about an hour after the initial stir frying. Heat the oil in a pressure cooker pan and throw in the cumin seeds and whole dry red chillies. Wait till they crackle and add in the garlic, 1 tbsp of ginger julienne and onions in that order . Toss the pan a few times to coat the onions and let them get pink on margins. No browning is required as the onions are meant to get mushy slushy and coat the chickpeas when cooked. Add salt to the cooking onions to quicken the process. Add the powdered spices and toss a few times till the roasted aroma of the powdered spices hits your nostrils. Add the slit green chilly. Add the soaked and drained chickpeas, pour a cup of water, cover the lid and cook over high heat till the whistle blows. Lower the heat and cook for 12-15 minutes more. Let the pressure release while the cooker cools down. Add amchoor powder and mix well. The amount of amchoor powder will depend upon how much chilies you are using. I used my homemade amchoor powder, you may need some more or less if using the store bought ones.The sourness balance the heat of the red and green chilies being used. Add the remaining ginger julienne in the last. This is the way I like it. The taste of some of the ginger slivers is so good in the spicy slush which coats the chana. You might like to add some more of ginger in winter months as it feels almost warming in those days. The whole red chilies should be discarded before serving. Some people even like those red chilies wrapped into a large piece of paratha. Do not worry about the heat hitting your tongue if you try this as most of the heat of these chilies has gone to the chana masala .... It is definitely a hot dish . oooooooooooooooohhhhhhhhhhhhh one of my favourites ..
yummy and mouth watering recipe. Thanks Everybody for the sweet comments. @ Bikram...the chhole rajma recipe are labled as Chhol/rajma/chane and you can find them in my archives. There is one chhole recipe with chicken too and i know you would love that. oops Bikram ..it is rajma/chhole/chane ..find that out. My all time favourite preparation of kala chana, reminds me that its been a while since I made these :). Is weekend pakka, I like these with lightly toasted bread too... Or with a topping of curd and some chat masala on top :). 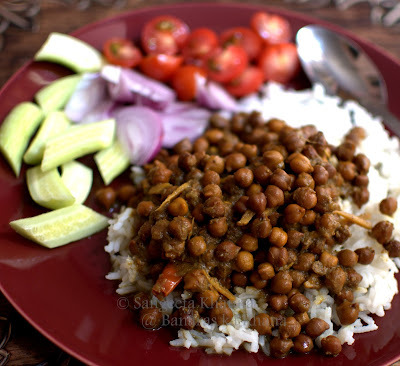 I know - I know, someone out here is not fond of chat masala ;-) Btw, I boil the channa first and then make the ghughni... Do you think making this way will add to the taste...? @ Anonymous ..with lightly toasted bread it would be okay but no chaat masala for me. I like curds with it when i have it with rice . 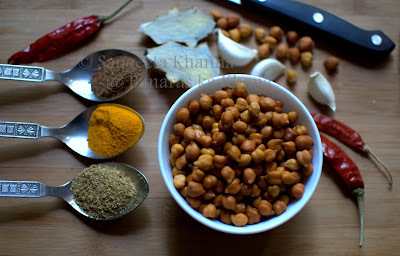 When you make the ghugni after boiling the chana it is very much different from this , try this once and you would know. how are you..hope u remember me..
welcome to my blogs Ashwini. Like the Channa gughani..we make Makki ki gughani with corn kernels. Would love to try this out. @ Sanjeeta KK ..yes , we like the corn kernels too but made in a different spice mix. Have posted a few of them earlier. i love this dish sangeeta! with pooris infact. 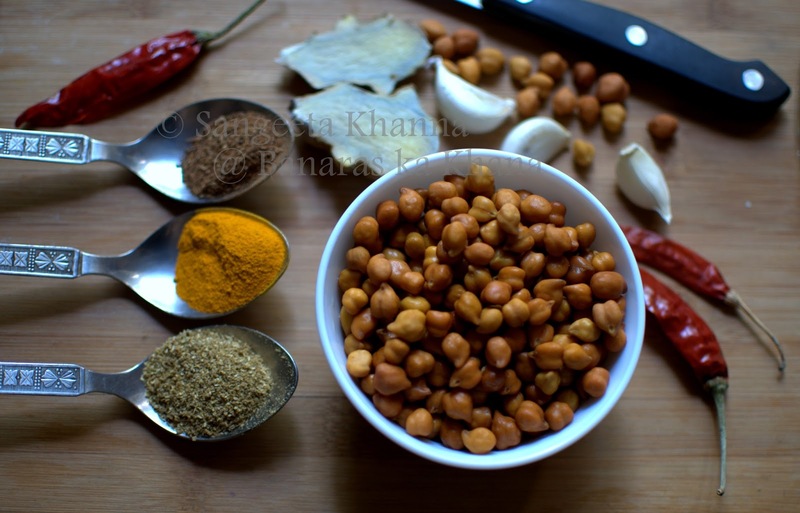 and i make black chana in a similar recipe with a little extra cumin. Sangeeta I too can have this ghugni anytime of the day -the pics are drool-worthy. but this Banarsi thing turns out to be differently flavoured than another favourite -Amritsari chole.Guess its because of Ghee and anardaana . @ Rajani ..even we like it wit either poori or plain parathas ...extra cumin is great anytime. @ Varsha ...yes this banarasi ghugni is way different from the punjabi chhole. I have posted the authentic punjabi chhole too ...do check out if you want to make them....and i don't use ghee or anardaana in that as i don't like the grainy texture of anardana in my chhole. Hi Sangeeta, I tried ur chana masala the other day, it came out very well, we loved the flavor. Ur jeera-aloo looks great too, will give that a try also. Thanks for the nice feedback Supriya ..this is what brings me back to my blogs . Try the jeera aloo and let me know how did you like it. Tried this recipe yesterday for dinner and it was wow. have sent it in my kids tiffin box. Hope he likes it too . Yummy. I am making this recipe tomorrow :).